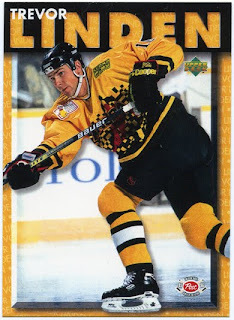 Trevor Linden has been the staple of my hockey card collection for over 10 years now and with over 900 cards in my collection, I thought I'd share some of my favorites. In this weekly segment, I will be looking at not just the card itself, but where Trevor was in his career at the point of the card's release, as well any any other interesting tidbits from the time period. The first card in this series is definitely one of my all-time favorite Linden cards, and I picked it up for less than a quarter. How many of you remember the lockout of 1994? I do. It was the first time I had ever witnessed a work stoppage in the NHL. I didn't know what to think at the time, I just wanted them to play. Trevor was really stepping into his own - remember those Stanley Cup finals vs. the Rangers? I do. It was without a doubt the greatest final series I have ever seen. Anyways, it was mid-November and the NHLPA decided to put on a "4-on-4 Challenge" to raise money for charity. The games were played in Hamilton and there were four teams based on where players were born (Ontario, USA, Western Canada and Quebec). There would be four players a side plus a goalie and they were pretty relaxed on some of the rules. After a goal, an icing or an offside they would just pick up "pond hockey" style. While some players during the lockout decided to play over in Europe, these series of games still managed to pull in some big stars. Patrick Roy, Ray Bourque, Luc Robataille, Brett Hull, Joe Sakic, Doug Gilmour and Mike Richter to name just a few. For me, the chemistry that Trevor Linden and Joe Sakic had was awesome. I thought that if there was any way for the Canucks to trade for Sakic, the cup would be theirs. It was pretty entertaining hockey (heck, at that time, I think we'd pretty much take anything) and the event raised over 1/2 million dollars. Not bad for something that was whipped up pretty quickly. As for the card itself, I like the bold last name at the top of the card. Something about the uniqueness of it really drew me in. And the uniform - well, what can I say. These guys made beige look good long before the Nashville third jerseys came to be. A simple card design that evokes a ton of memories from a specific and pivotal moment in hockey. That's what I like about this card. For those who have no recollection of the NHLPA Challenge, there is some footage of it out there (not much though). Here's some of the Ontario/Quebec game (the announcing is in French). Enjoy. I agree. The Post logo does stick out a bit too much. 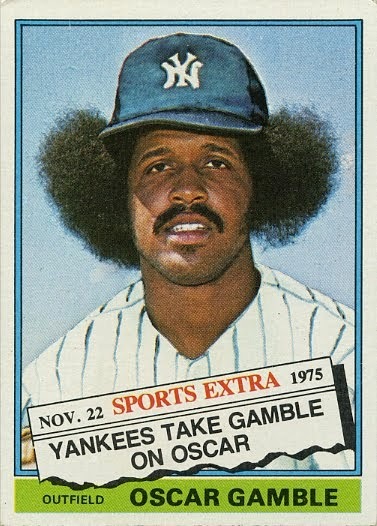 It does not appear that Joe has a card in this set. It seems though that he has one in the set the year before (94/95) and the year after (96/97).